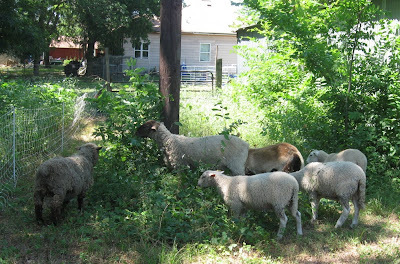 Finally, the motley sheep crew got to dig into the grass and brush in the north pasture. The move was delayed by a series of unfortunate events, but now, everything seems to be working. The electric netting is up and operational, and encloses an area of grass, vines, small trash trees, and lots of poison ivy. They love it. I'll have to remember not to snuggle them too much for a while, until the poison ivy is gone and washed off of their fleeces. If you see me covered with Calamine lotion, you'll know I forgot myself. 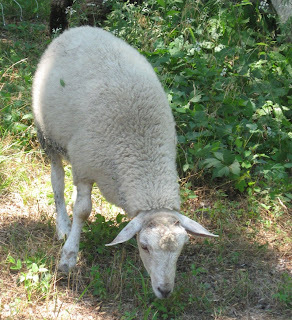 In the meantime, the sheep are busy brush-busting. It's a great area with both shade and sun most of the day. As we speak, the flock is sleeping in the shade after several hours of browsing. One down side to this new arrangement is that I have to carry water to that pasture. But aside from that, it's great to get them off of that overgrazed paddock and let it rest. Congratulations on braving the North Pasture!!! That's what I was just thinking! Not only hard, but sounds like you could pull your back out if your not careful!! Looking forward to seeing you Saturday morning! this is great, your own lawn mowers!!! I'm sad I missed the giveaway, sigh. I'll have to move your Ravelry board higher up my page!!! What a charming, sweet picture. It looks almost angelic, doesn't it? Glad you were able to get this done. Cindy, I wanted to come on Saturday a.m. and help, but I just don't think I can this week. To be honest, I'm just pooped with my first week of being back at work. If I wake up early enough (what time are you starting?) I'll come up and help; otherwise, you'll know that I'm dragging and won't get there in time. Love ya!!! !